I have laughed and cried with you. I have bitched and moaned and celebrated my successes. I have been sick and almost died and come back. I have found life. I have found beauty in life. I have made friends that I’ll have for a lifetime. I have learned that I am not alone. Never. I have learned that I am good. I have suffered the death of my daughter. I have found peace in her passing. stories about my man and my man-child. I’ve rekindled my passion for writing. I was commenting to W that I still wished I was skinny. She looked at me, exasperated, and told me that I was still “very thin” and still much thinner than the average woman for my height. It made me realize that I coincide the words “skinny” and “emaciated,” and that I can still indeed be the former and be at a healthy weight. For so long, even when I was underweight, I thought I was fat, so to be “normal” and “healthy” is, well, “weird.” But “good.” Why am I putting everything in quotations? My English teacher is rolling in the “proverbial grave” right now. Bahaha. And the therapist takes me in the second half with her elementary logic for the win! Anyone else “forget” that, too? I believe I ordered the LARGE Diet Coke. Hello! 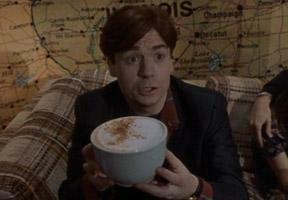 In the original quote, Mike Meyers, in So I Married an Axe Murderer, is talking about his cappuccino, not Diet Coke – but still, very fitting, seeing as I am currently drinking an urn. Tonight, the besties, Misses W and S (respectively) are coming over for a slumber party. We are going to braid each other’s hair and paint our toenails and eat weight gain portions of snack food. We are going to laugh and facebook stalk and play truth or dare. Shop Owner: Sir, I can't replace the plant just because you killed it. Gerhardt: I did not kill this plant, it was sick or something. I gave it everything. I was talking to it, telling it stories. I drew a sketch of it, and put it on my refrigerator. Shop Owner: Did you water it? Gerhardt: I-- I have-- It's important that I did not kill this plant, you understand? So if you're just saying that because that's how you're making your excuse, you have got to understand-- You can't mess with-- I'm never gonna get laid. [Sobs] You obviously don't care. And that's one thing I do, is care. I feel sorry for all the plants in here. I'm going home. Hope you all have a happy Friday as well! :) And, if you haven’t yet seen 28 Days, put it on the list. After I lost Kendall, I will admit to you, dear readers, that seeing pregnant women and even my pregnant sis-in-laws, getting big and ripe with babies, made me angry. Not at them, not at all, but angry at myself for not being pregnant anymore. Angry at God for taking Kendall from me. Angry at the world, dammit, because life continued on when I felt like mine had come to a devastating, grinding HALT. I was jealous. With a capital freakin J. My eyes would fill with tears when I heard of women announcing their pregnancies. I ached for a baby of my own. Congrats to my twin brother Brett on becoming a daddy to the most darling little girl I've ever seen. 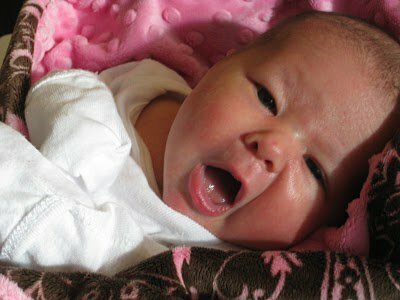 Penny Hazel was born on April 5th at 1:54 pm, 8 lbs 3 oz, 21 inches long. Way to go Brett 'n Ang on making them as cute as me! Yeah. I just went there. Today, we are honoring you. We are honoring the life you could have lived, and the woman you could have been. Because today Kendall, I should be in a hospital crying in pain but also for joy, giving birth to you. I should be anticipating your arrival. I should be wondering what outfit I will first put you in, and I should be arguing with Daddy about what we will name you. I should have an orange and yellow nursery all set up for you, complete with a fashionable wardrobe and that darling designer diaper bag I had my eye on that you know I would have rocked. But instead, today, I am only mourning your loss. I am missing you so fiercly it hurts. I will never in this lifetime be able to marvel at your fingers and toes and squishy little thighs and thick dark hair. I’ll never know if you have dimples and bright blue eyes like your older brother Cade. But I do know you. I know the wonderful little girl you are, and the amazing, bright, talented woman that you would have grown up to be. I am devastated that I’ll never be able to see these things for a long time to come, until one day when we are reunited, and I get to hug you and laugh with you and tell you lots of stories about Daddy and Cade and all the things you missed out on by being taken from me so early. Yes, Kendall, I am devastated by your loss. But I am also joyful that I got to have you for even the shortest time I did, and I am blessed and grateful to God that I got to know you as only a mother carrying her child gets to know them. I’ve been so caught up in being angry at your loss. Angry at myself for not being able to save you, and angry at God for taking you away from me far too early. Angry, even, Sweet Baby, at you, for leaving your mama when she needed you so badly to stay with her. And today, Kendall, that is why I am memorializing you. Because I know it is time for me to move on from the anger that consumes me, and move to the peace I can feel from God and all of the people here who love me and you and mourn your loss. I know it is time to let go of my anger and instead be grateful for you and for all you gave me, even when you were just inside me. Because, Kendall, you gave me strength. Strength I had no idea I even had. You gave me courage to move on from an eating disorder that I have struggled with for ten years. I will always feel your loss in my life; there will always be a small part of my heart that is empty without you here. But your loss has also filled my life and heart with new things. It has filled my life with courage to face the things in my life that hurt me and move on from them, because Kendall if I can grieve for you and still breathe and live and thrive through it all, I know that nothing can stop me from living a happy life with no regret or resentment. When you died, I nearly died. I didn’t want to live anymore. I stopped eating and drinking and when I was in the hospital, having your sweet little body removed from mine, I nearly died. But, against all odds, through everything I’ve put my body through, I am here. I am alive. And I no longer will squander the life I have been given. I will never take for granted life and breathing and laughing again. That would be disrespectful to your short life, and it would be disrespectful to mine for all that I have endured. In short, Baby Girl, you have taught me to live. You have taught me that life is worth living. And, I promise, Sweet Girl, that I will never waste my life again. Your mama is going to make you proud. Daddy and Cade and I will always miss you. We will never forget you. You will always be my first daughter, my second child. Times will change, new children will be born into our family, but I will never ever forget you and the vital role you play in my life and family and how you have impacted me for the better. I will never forget the life you could have lived. I will never forget how much you inadvertently taught your mama strength and courage and hope. So, I hope you are in Heaven looking down on us right now, smiling in anticipation for all the balloons that will soon be sailing your way. I hope you will know that each balloon comes with love for you, and love for the life you could have lived. Know that these balloons are not just for you, but for others that people here have lost. I like to imagine that you and the others are in Heaven feeling joyful as we are honoring you and doing our best to let each other know how vital it is to learn and grow from the spirits that were taken from us too early. 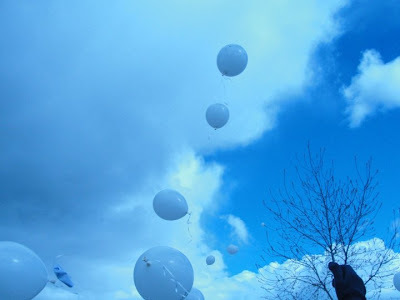 Letting go of these balloons does not mean that we are letting go of our love for you or for the grief we feel. It is letting go of the anger and resentment that has held us down since we have lost you. Until me meet again, my baby, hold on to these balloons. For they represent the love and honor we have for you. You are my little hero. You saved me when no one else could save me. And for that, your mama will forever be indebted to you. You are good. You are my daughter. And I love you. Today is the big day. Been getting ready for it. Been feeling very nervous about it. The weather is supposed to be cloudy and windy and rainy and blustery. I don't think Kendall will mind. I imagine Kendall smiling in anticipation at all the strings that will soon be flying her way. 296 E. Murray Park Ave. I will bring white balloons, but you may want to bring your own in case I don't have enough. Please, if you are planning on attending, let me know so that I can have an accurate guesstimation of how many balloons to bring. Being able to join with you and share my grief, but ultimately JOY for my daughter will mean so much. And, again, because my BFF Stephanie has an amazing way with words, please visit her blog -->here<-- to read the lovely post she wrote about Kendall and her daddy. Love you all. So, so grateful to God I have you during this difficult time.